"Massachusetts, Town Clerk, Vital and Town Records, 1626-2001," database with images, FamilySearch (https://familysearch.org/ark:/61903/1:1:FHHY-6VH : 13 July 2016), Ann Janett Lazell, 22 Jan 1830; citing Birth, Middleborough, Plymouth, Massachusetts, United States, , town clerk offices, Massachusetts; FHL microfilm 945,015. "Massachusetts Deaths, 1841-1915," database with images, FamilySearch (https://familysearch.org/ark:/61903/1:1:N7KD-SQP : 10 December 2014), Augusetta Richards, 29 Aug 1884; citing E. Bridgewater, Massachusetts, v 356 p 302, State Archives, Boston; FHL microfilm 960,226. Vital Records of Abington Massachusetts to the year 1850, , at https://archive.org/stream/vitalrecordsofab00abin . Boston, Mass. : New England historic genealogical society, at the charge of the Eddy town-record fund, (1912) , Vol. 1, p. 133. "Massachusetts, Town Clerk, Vital and Town Records, 1626-2001," database with images, FamilySearch (https://familysearch.org/ark:/61903/1:1:FHHY-6VS : 13 July 2016), Caleb Gannett Lazell, 21 Aug 1825; citing Birth, Middleborough, Plymouth, Massachusetts, United States, , town clerk offices, Massachusetts; FHL microfilm 945,015. "Massachusetts, Town Clerk, Vital and Town Records, 1626-2001," database with images, FamilySearch (https://familysearch.org/ark:/61903/1:1:FHHY-6V7 : 13 July 2016), Charles Frederick Lazell, 03 Jan 1828; citing Birth, Middleborough, Plymouth, Massachusetts, United States, , town clerk offices, Massachusetts; FHL microfilm 945,015. "Massachusetts, Town Clerk, Vital and Town Records, 1626-2001," database with images, FamilySearch (https://familysearch.org/ark:/61903/1:1:FC9Z-85V : 13 July 2016), Charles Lazell, 23 Aug 1832; citing Death, Middleborough, Plymouth, Massachusetts, United States, , town clerk offices, Massachusetts; FHL microfilm 945,016. "Massachusetts Marriages, 1841-1915," database with images, FamilySearch (https://familysearch.org/ark:/61903/1:1:NWY3-Y9N : 17 February 2016), Nathan M. Poole and Jane B. Lazell, 15 Aug 1850; citing , North Bridgewater, Massachusetts, United States, State Archives, Boston; FHL microfilm 1,428,258. "Massachusetts Deaths, 1841-1915," database with images, FamilySearch (https://familysearch.org/ark:/61903/1:1:N7RT-6FW : 10 December 2014), Jane B. Lazell Poole, 02 Nov 1891; citing E. Bridgewater, Massachusetts, v 419 p 515, State Archives, Boston; FHL microfilm 961,504. "Massachusetts Births, 1841-1915", database with images, FamilySearch (https://familysearch.org/ark:/61903/1:1:FXC7-L4P : 1 March 2016), Frank Morton Pool, 1851. "Massachusetts Deaths, 1841-1915," database with images, FamilySearch (https://familysearch.org/ark:/61903/1:1:N7PC-KMD : 10 December 2014), Morton Pool, 07 Jan 1856; citing East Bridgewater, Massachusetts, 01, State Archives, Boston; FHL microfilm 960,172. "Massachusetts Births, 1841-1915", database with images, FamilySearch (https://familysearch.org/ark:/61903/1:1:FXC5-33R : 1 March 2016), Cora Jane Poole, 1857. "Massachusetts Deaths, 1841-1915," database with images, FamilySearch (https://familysearch.org/ark:/61903/1:1:N7PX-MK3 : 10 December 2014), Elizabeth L. Pool, 21 Sep 1861; citing East Bridgewater, Plymouth, Massachusetts, v 148 p 313, State Archives, Boston; FHL microfilm 960,179. John Marston Lazell was born perhaps about 1791. Vital Records of Abington Massachusetts to the year 1850, , at https://archive.org/stream/vitalrecordsofab00abin . Boston, Mass. : New England historic genealogical society, at the charge of the Eddy town-record fund, (1912) , Vol. 1, p. 81. Vital Records of Abington Massachusetts to the year 1850, , at https://archive.org/stream/vitalrecordsofab00abin . Boston, Mass. : New England historic genealogical society, at the charge of the Eddy town-record fund, (1912) , Vol. 2, p. 81. Elizabeth Leach was born perhaps about 1819. 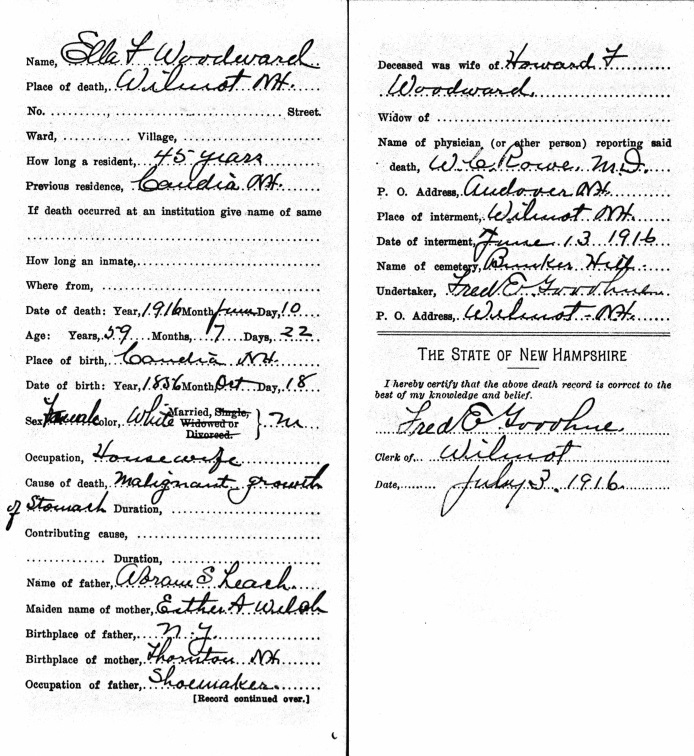 Ella married Howard Fiske Woodward, son of George E. Woodward and Maria E. Matthews. Jane Leach was born perhaps about 1823. Samuel Leach of Vermont was born perhaps about 1790. "Vermont Births and Christenings, 1765-1908," database, FamilySearch (https://familysearch.org/ark:/61903/1:1:F8LV-836 : 12 December 2014), Thomas Russell Leach, 19 Jul 1821; citing SUTTON TWP,CALEDONIA,VERMONT, reference ; FHL microfilm unknown. Suzanne M. Leahy is online at https://www.facebook.com/suzanne.woodward37. ENGAGEMENTS, Boston Globe, unknown location, Aug 31, 1969, p. 34. Lucius Robinson Paige, History of Cambridge, Massachusetts. 1630-1877: With a genealogical register, , at https://books.google.com/books?id=Yc00AQAAMAAJ . New York, Cambridge: H. O. Houghton and Company, (1877) , p. 503. "United States Census, 1870," database with images, FamilySearch (https://familysearch.org/ark:/61903/1:1:M6DX-Z31 : 17 October 2014), John D Lathe, Maine, United States; citing p. 97, family 782, NARA microfilm publication M593 (Washington D.C.: National Archives and Records Administration, n.d.); FHL microfilm 552,040. Middlesex County (Mass.) Probate Packets (1 - 4702) (Second Series) 1872-1967 (And 4703 - 19,935); Author: Massachusetts. Probate Court (Middlesex County); Probate Place: Middlesex, Massachusetts. Census Place: Taunton Ward 8, Bristol, Massachusetts; Roll: T625_688; Page: 10A; Enumeration District: 202; Image: 457. 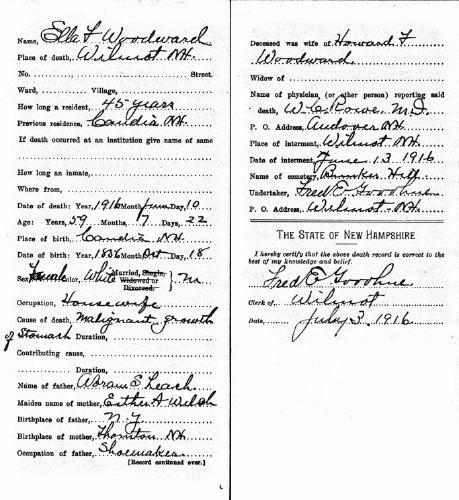 "Massachusetts Marriages, 1841-1915," database with images, FamilySearch (https://familysearch.org/ark:/61903/1:1:N4CM-S1Y : 17 February 2016), Horace F. Leathe and Agnes Cotter Woodfin, 30 Jan 1904; citing , Brockton, Massachusetts, United States, State Archives, Boston; FHL microfilm 2,057,590. "Massachusetts, Town Clerk, Vital and Town Records, 1626-2001," database with images, FamilySearch (https://familysearch.org/ark:/61903/1:1:FHHJ-DLP : 13 July 2016), Charles Stone and Isabella W. Leathe, 04 Nov 1846; citing Marriage, Cambridge, Middlesex, Massachusetts, United States, , town clerk offices, Massachusetts; FHL microfilm 772,614. "Massachusetts State Census, 1855," database with images, FamilySearch (https://familysearch.org/ark:/61903/1:1:MQWT-SMD : 15 November 2014), Charles Stone, Ward 02, Cambridge, Middlesex, Massachusetts, United States; State Archives, Boston; FHL microfilm 953,948. "United States Census, 1870," database with images, FamilySearch (https://familysearch.org/ark:/61903/1:1:MD38-7VV : 17 October 2014), Charles Stone, Massachusetts, United States; citing p. 42, family 349, NARA microfilm publication M593 (Washington D.C.: National Archives and Records Administration, n.d.); FHL microfilm 552,123. "United States Census, 1900," database with images, FamilySearch (https://familysearch.org/ark:/61903/1:1:MMLF-QTR : accessed 28 November 2016), John Leathe, Portland city Ward 6, Cumberland, Maine, United States; citing enumeration district (ED) 69, sheet 16A, family 338, NARA microfilm publication T623 (Washington, D.C.: National Archives and Records Administration, 1972. ); FHL microfilm 1,240,591. "Massachusetts Marriages, 1695-1910," database, FamilySearch (https://familysearch.org/ark:/61903/1:1:FCWV-5N5 : 4 December 2014), John D. Leathe and Sarah B. Simonds, 19 Oct 1845; citing reference ; FHL microfilm 496,864. "Massachusetts Deaths, 1841-1915," database with images, FamilySearch (https://familysearch.org/ark:/61903/1:1:N4QP-FV3 : 10 December 2014), Sarah Burrill Leathe, 08 Jan 1912; citing Hudson,,Massachusetts, 264, State Archives, Boston; FHL microfilm 2,397,992. "Massachusetts Births and Christenings, 1639-1915," database, FamilySearch (https://familysearch.org/ark:/61903/1:1:FZSM-H7S : 4 December 2014), John D. Leathe in entry for Leathe, 05 Oct 1849; citing LOWELL,MIDDLESEX,MASSACHUSETTS, ; FHL microfilm 927,928.